Though he favored his works throughout Europe, he is probably most widely known for his impact on the design and structure of modern Brasilia, the capital of Brazil. 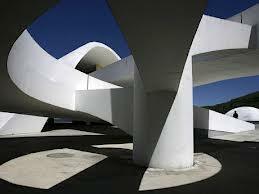 Niemeyer was educated at the Escola de Belas Artes. His architectural career began in the early 1930’s. He almost immediately gained recognition for his unique modern style and for a series of early architectural gems. His most recognizable works are incorporated into Brasilia, designed in the late 1950’s and formally recognized as the capital of Brazil in 1960. It was designated as a UNESCO World Heritage Site in 1987. Brasilia was designed as a planned futuristic city in which the quality of living was enhanced by incorporating forested areas into residential communities, distributing small commercial areas throughout the city, adding cafes, parks and entertainment areas as well as an efficient transit system. These attributes, combined with the gentle rhythm of the architecture are seen, even today, as beautifying and enhancing the life and culture of a community. Niemeyer has been widely recognized and has received prestigious awards, including the Pritzker Prize in 1988 and the Royal Gold Medal for Architecture from the Royal Institute of British Architects in 1998. A true creative genius, his impact on urban design cannot be overstated. His genius will live on in the buildings he designed, and those that will continue to be built in their image. Photograph from gpb.org. Taken in 1960. This entry was posted in Community and tagged architecture, Brasilia, Brazil, Design, Modern Design, Modernism, Oscar Niemeyer. Bookmark the permalink.